Money; a medium that can be exchanged for goods and services and is used as a measure of their values on the market. What would you like to do if money were no object? Our in-house artist, Lyndon Jugalbot has designed one of the uniqueness bill changes which grants you an ability to manipulate the value on the bill like never before. If you could change the value on the bill, this is how it would look like. -Two version: Multiple bills change and single bill changes. -Fully examinable before and after the performance. -Performed with borrowed bills if you wish. -Multiple variations. -Reset in seconds. -Easy to learn and perform. -Props are included. -Approximately 50 minutes instructional video in-depth training by Lyndon Jugalbot. Look no further. 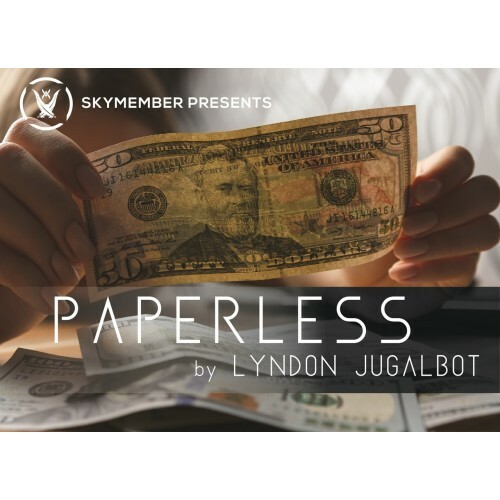 This is Paperless, get yours now.